Those of you that know me well enough know that I am in love with Coca Cola! I am having a super hard time kicking the habit! Uggghhh!!! Well check out what Beth came up with at Life On Maple. 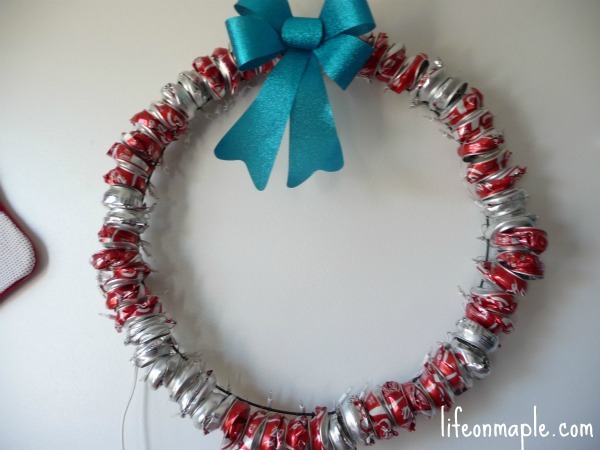 She made this wreath out of Coke and Diet Coke cans. Pretty swell! It would probably take me about two days to save up for this project with as many sodas as I drink – it’s horrible I tell ya! At least I could be doing something productive with all of those cans laying around and you know I am not too shy to go swipe some from the curbs on Recycle Day if need be! I have also always been in love with other can crafts but just don’t think I would have the time or patience to try them. In addition I see myself getting hurt while trying to cut the cans, so would try to avoid the ER as much as possible! And finally, this little picture makes me smile. I had a hard time tracking down the original source but will try my hardest to give it credit. It reminds me of a little old man that I saw as a child. 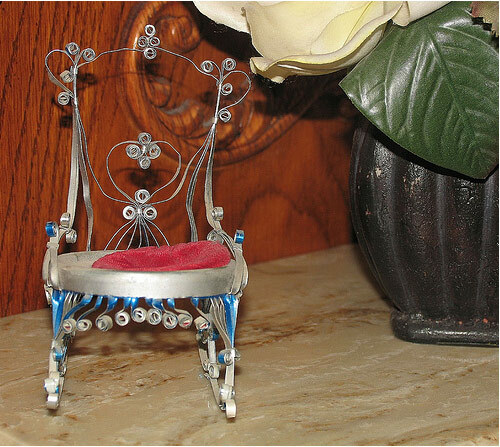 He was at a little craft show making little dollhouse furniture out of soda cans. Each creation was so unique! 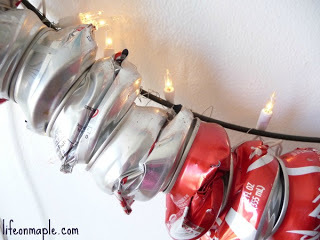 Maybe I should rethink my gift ideas and make some soda can crafts for all of my family this year for Christmas! — Just kidding! Again, thanks to Beth over at Life On Maple, for the inspiration. Okay now, I have a serious problem. 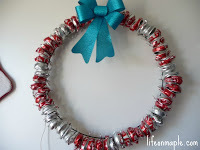 I have already drank enough cola since this post to make a wreath of my own! Tempting but have to refrain my craftiness this week (well I'll try to at least) and attend to some more serious matters like girly luncheons, school holiday parties, Christmas shopping, Birthday shopping (for sis and me!) and lots of gift wrapping. Now where's my Coke? I need some caffiene!